Playing loud music for 48 hours straight in America usually characterizes musical drug fests in the desert or a really bad breakup sob-fest in one’s room. 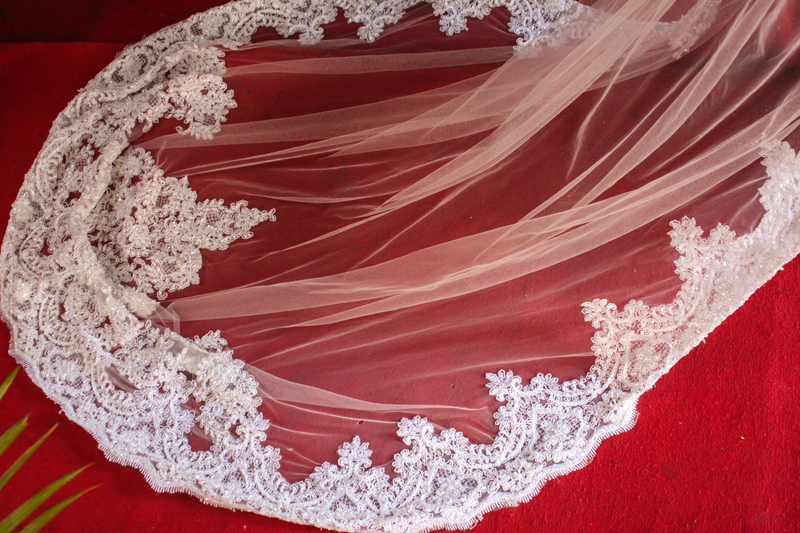 Here it means one thing: a wedding. And music announces its presence to the entire neighborhood. My friend Sari announced she was engaged with a sigh, a wedding means a lot of work and a lot of formality and after living almost half her life in the U.S. she was unenthusiastic about either, but still, deeply in love, and one must make sacrifices for love. I excitedly bobbed up in my seat and offered my services as a photographer imagining the cultural experience of a lifetime and an opportunity to help out my friend. 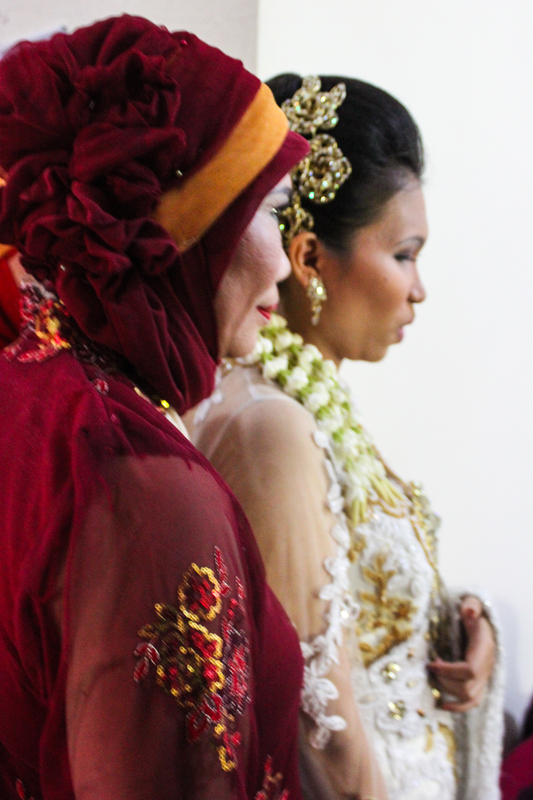 As I learned from detailed explanations from Sari, a lot of elaborate formality goes into a Javanese wedding. However, the splendor doesn’t go into the proposal, it goes into the procedure and event afterward. Girls don’t dream of their man taking them to some amazing place or fashioning an elaborate scheme before dropping to one knee and spouting romantic sonnets enveloping a dream for the future and a promise of everlasting love before slipping a ring on her finger. He simply asks. There is no ring presentation or fanciness. It’s the simple question of asking someone if they want to spend the rest of their life with you. Yes? Great. After that the man must ask the woman’s family, and if they accept it’s time to start calculating a date. 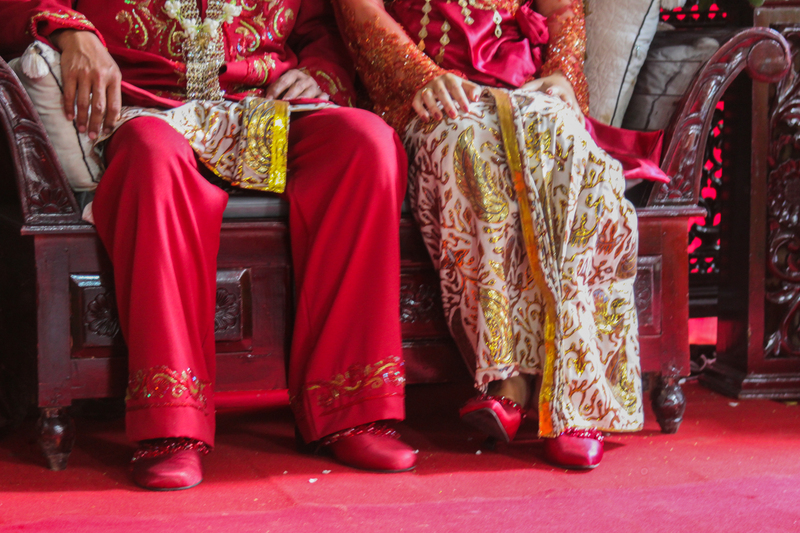 The elders of the family have a secret astrological numerology formula that takes the birthdays of the couple and produces a perfect day for the couple to be wed. If the two birthdays prove incompatible, marriage is not advised and may mean demise for the relationship. The calculation takes days to do and the couple doesn’t get input. Afterwards they may beg for a recalculation if plans interfere. Once a date is set preparation is set into motion. 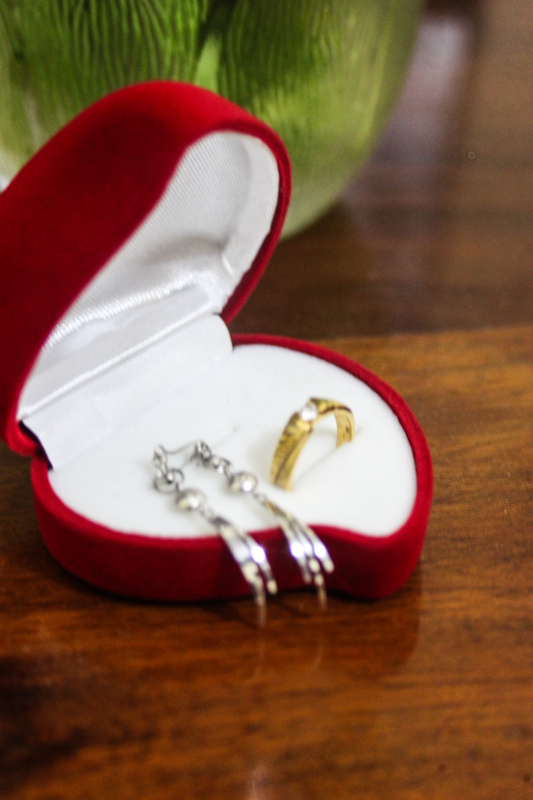 The man buys everything for the woman’s big day including two dresses, makeup, the ring and earrings which she usually doesn’t get to see. (This is when you wish that you were marrying a gay guy with great fashion sense) The dresses can be any color, so hopefully while dating you drilled your favorite colors and violently voiced hate for unflattering hues in the dating stage so you don’t end up with pictures to complain about for the rest of your life. 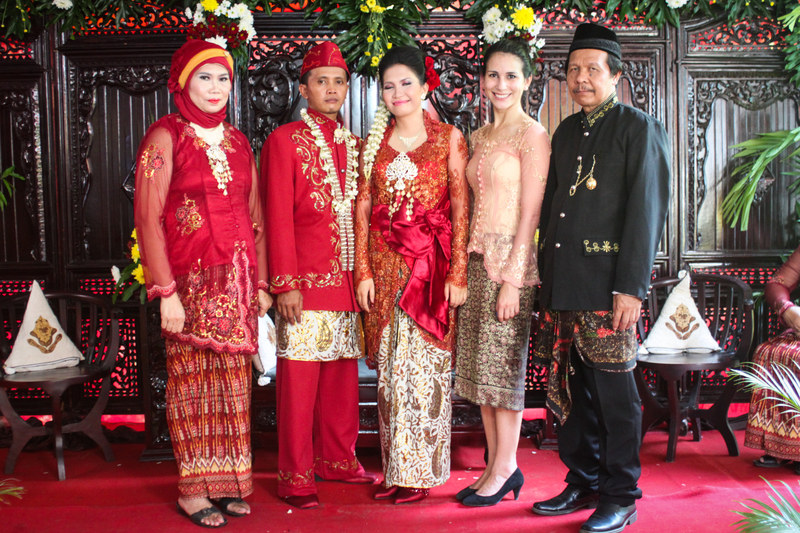 After all this was complete, I made the 6 hour trip out to the city of Jember in East Java with her sister and a cat: both holding VIP wedding guest status even though one of them would spend most of the wedding in various hiding places and the other meows. We arrived the day before the wedding and the extended family were bustling around the house mostly cooking non-stop. “Andrea, we are so sorry you are vegetarian” was the mantra of the weekend although I satiated myself by discreetly singlehandedly demolishing platters of cookies, steamed brownies, banana bread left out for guests in between the occasional helping of soup and vegetables. Music permeated the air all day and into the night after a long day of errands, test make up sessions and eating, eating, eating. When I awoke the next morning at 5 the backyard had been transformed into a tented stage complete with carved wood paneling and topped with flowers. 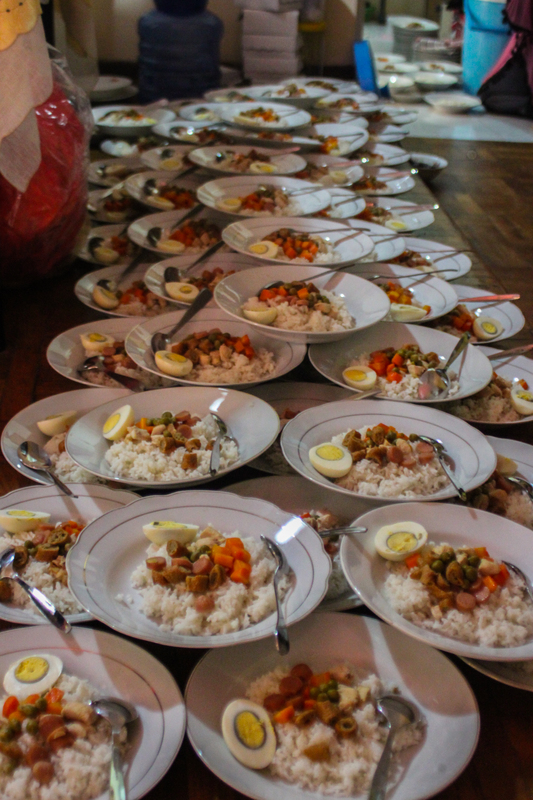 The caterers were busy preparing the food for the buffet that would feed all guests, the women inhabited every room of the house getting transformed into porcelain dolls and having their hair done or wrapped up in an elaborate hijab consisting of several pieces of beautiful material and putting on their kebaya: a corset like undergarment made of mesh that is embellished with embroidery, countless beads, and sequins then topped off with a sarong like skirt. It was a hair spray cloud of womanly glory that covered the house like a pink haze and made most of the women unrecognizable to me. The ceremony can be described by my observations though I understood so little of it. First a bunch of relatives arrived and then there was a prayer ceremony for the men and the groom knelt at a table being led by another man on a microphone. Men clustered into the room sitting cross-legged and reverent’ spilling out the front of the house onto the carpeted driveway. Then there was a chanted song that all the men joined in for and the bride made her appearance accompanied by her mother and other attendants. She sat down next to her fiancé and they both did some ceremonial things before signing papers and showing them off to snapping cameras. Then he slipped the ring on her finger, more photos, they paid respect to their parents through bowing and taking the parent’s right hand in theirs in a salim gesture of respect and touching it to their forehead. Switch parents and repeat. Then the couple made their way into another room and sat in twin thrones while posing for pictures as breakfast was served to the guests: noodles, rice an egg, some meat and veggies filled large bowls; quickly making way into the stomachs of the guests who have all been up for about 5 to 6 hours at this point. There is a brief resting period before the reception. Cousins passed out on the couches and I found some sleep in a chair for 15 minutes before a snore coming on caused me to grudgingly awaken. 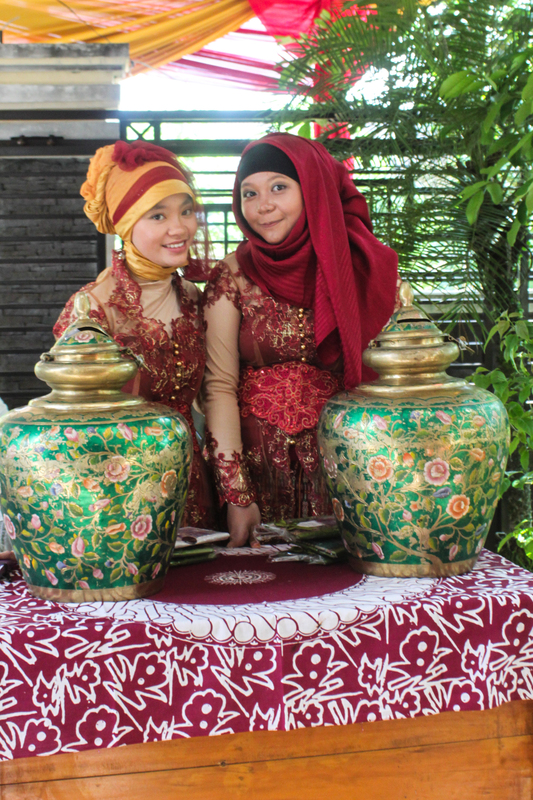 The wedding reception procedure started at the entry where guests are greeted by a duo of two charming teenage cousins who hand out the wrapped wedding favors, in exchange, guests drop off money or a gift. Sari’s sister pointed out large green painted vases, “These are for, you know…” as I noted the small piggy bank like slot in them. 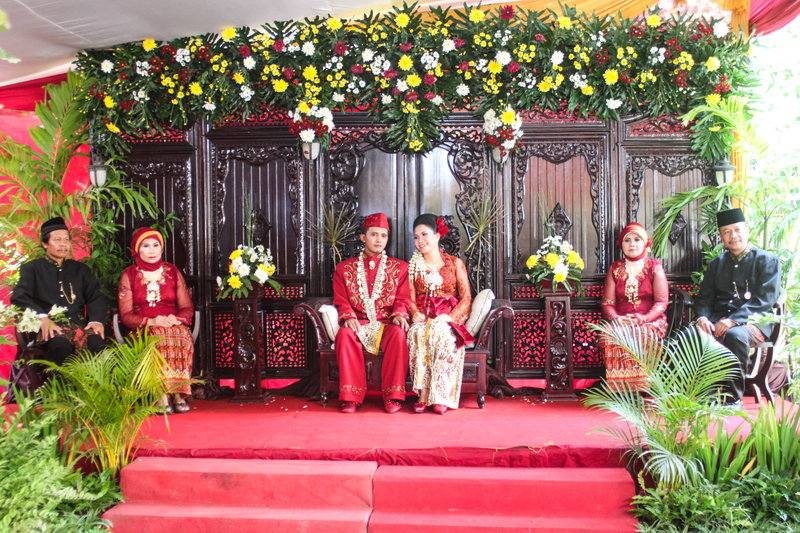 The next stop for guests is stage where the couple and their parents are on display on their throne like chairs. Then stop at the buffet to eat, and mingle. And finally guests leave at leisure. For the 3 most important couples it means a long time of sitting, looking regal in spite of the sweltering heat and humidity and posing for pictures as guests come and go like beautifully patterned moths at a flame. I partook in the sitting from the sidelines waiting for guests to arrive and greet the families being ever aware of the “camera” signal given to me by Sari’s father marking the family’s favorite guests for a photo op. And then slowly after 3 hours everything came to a close, the never-ending buffet started to dwindle, the family finally indulged in the remaining portions of the meal, and the event came to a close. The women took turns showering and changing: transforming from porcelain dolls into satiated and exhausted women, the relatives who had been present for 11 hours now took leave to go home and nap. 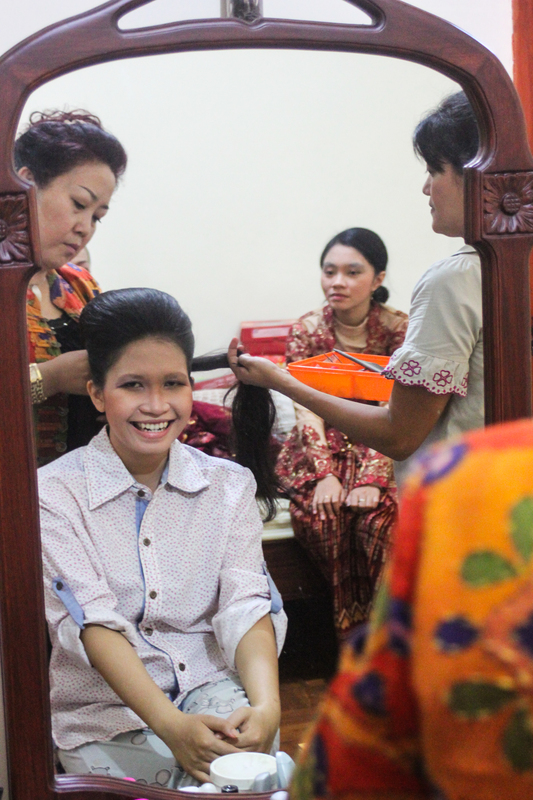 Sari phoned a professional dressing and makeup service to come liberate her from her outfit and hairstyle. I picked 14 bobby pins from her sister’s bun freeing her from her bonds. Then I took leave and showered the sweat from my body and noticed a few new mosquito bites before collapsing into the bed I had been given for the weekend. The whirlwind of wedding madness extinguished. All that remained was the traditional music that would go on until morning. The beauty and excitement of it all was wonderful, the family getting together in a reunion of beautiful costume, tradition, and helping together to create a spectacular celebration of enduring tradition for the couple was amazing to be a part of. Great recap with that unique Andrea humor and insight. Learned a lot and got my Andrea fix, which of course, just builds the craving for more.